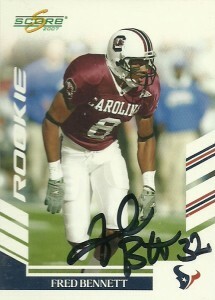 After Bennett was a two time SEC choice, Fred was drafted in the 4th round of the 2007 draft as a compliment to former Gamecock Dunta Robinson. (Robinson was going to mentor him up to the speed of the NFL game.) Unfortunately Fred Bennett got thrown into the fire when Robinson went down with a season ending knee injury in week 9 that season. Bennett responded surprisingly well, making 55 tackles, 3 interceptions and 14 passes defensed. Bennett would then start an additional 6 games for Robinson in 2008 (before Dunta returned) grabbing 2 more interceptions and 6 defenses. Questionably, Bennett from other accounts fell into the team doghouse and had to dig himself out by the end of the season, and started only 3 games in 2009, as a new secondary coach was brought in. Caught in a numbers game, Bennett was cut by the Texans in 2010 and was signed by the San Diego Chargers within days.